Crises such as income loss, hunger, and homelessness can happen any time to virtually anyone. At United Way of the Greenbrier Valley, connecting people in need with local resources and assistance is a critical part of our mission. The Emergency Food and Shelter National Board Program is governed by a national board composed of representatives of the American Red Cross; Catholic Charities, USA; The Jewish Federations of North America; National Council of the Churches of Christ in the USA; The Salvation Army; and United Way Worldwide. The Board is chaired by a representative of the Federal Emergency Management Agency (FEMA). What is United Way of Greenbrier Valley’s role? During its 28 years of operation, the national program has disbursed $3.7 billion to more than 13,000 local providers in more than 2,500 counties and cities. Locally, United Way of Greenbrier Valley administers EFSP funds to local emergency and shelter organizations. Warming Hands & Hearts is an emergency assistance initiative to help low-income families who are struggling with the high cost of home heating. 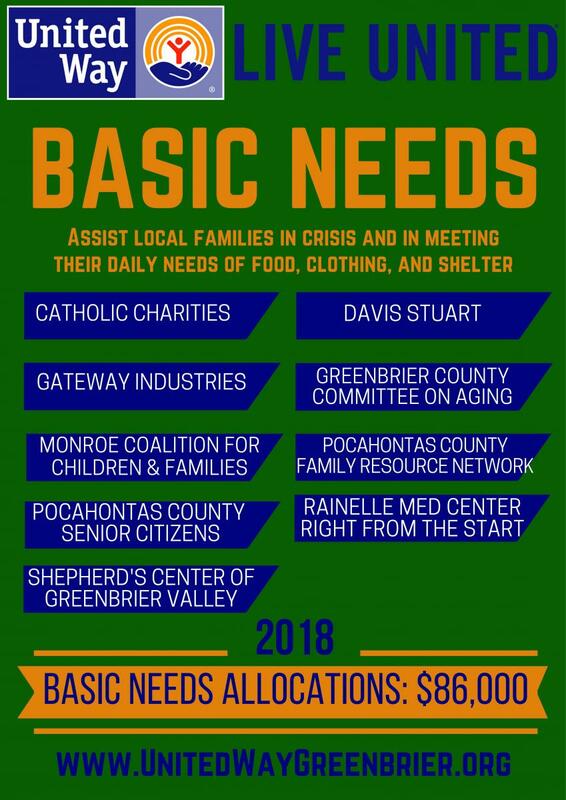 United Way of the Greenbrier Valley provided the leadership in establishing FCOC’s (Family Coordination Oversight Collaboratives) in Greenbrier and Pocahontas Counties, modeled after the one in Monroe County. Each County FCOC consists of area service providers and faith based organizations that offer emergency assistance. With everyone at the same table, emergency assistance dollars can be pooled to stretch as far as possible.